Drilling is a fabrication skill that is needed fairly often in the studio. Holes for cold connections, holes for piercing metal, and holes for jump rings are just a few examples of when you need to use the drill press. 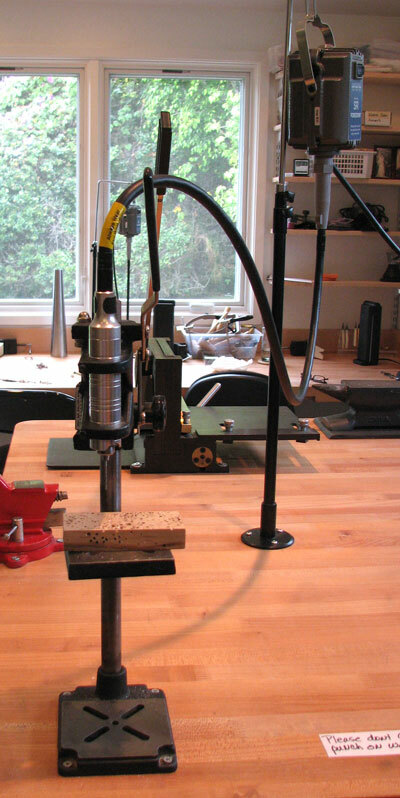 My drill press is powered by a flexible shaft machine. It is capable of making all the drill holes I have ever needed from small #60 drill bit holes to #30 holes. I especially like this system because it is small and uses up very little bench space. The drill press speed is controlled with a foot pedal attached to the flex shaft. Sometimes it is an advantage to have variable speeds, not generally an option in larger, freestanding drill presses. Like other power equipment in the studio, you can be harmed by not following proper safety precautions. There are a number of safety issues in using a drill press, but the one I see people not follow most frequently is failing to put on safety glasses. Get into the habit of donning the safety glasses every time you drill – you want to feel uncomfortable if they are not on. I recommend you get guidance from an instructor who is qualified in the use of the drill press in the beginning. Also, read and follow any material that comes with the flex shaft and drill press.